In its most basic sense, a "lens" is an object through which something is focused. This can literally mean bringing something into visual focus such as using a magnifying glass or binoculars, or it can mean "focus" in a more general sense such as "bringing to one's attention" or pointing one's "view" in a general direction. A lens can be made of glass or plastic or any other material which serves this purpose. In the case of a camera, a lens usually means a combination of single lenses designed to work together as a whole, and referred to as one whole. In this sense, "lens" means the lens as a whole and the individual lenses within are called "lens elements". A modern camera "lens" usually has several parts: a combination of "lens elements" and some manner to move the individual lenses in order to focus or sometimes "zoom" the lens as a whole. A lens may also be referred to as "glass" in photography slang whether it has any glass in it or not, as in "What kind of glass are you using?". On a film camera, the film is spread open in the camera behind the lens waiting to take a photograph. The film's location is called the "film plane" and is the surface the lens exposes to take a photograph. 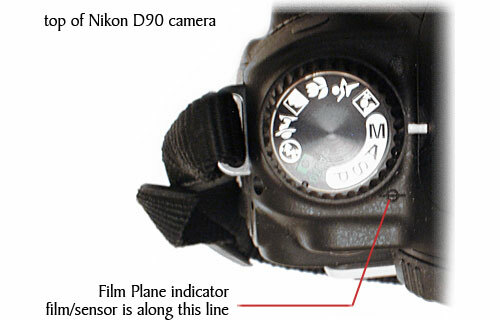 In a digital camera, the sensor which receives the image instead of film is still referred to as being the film plane and serves the same purpose. Higher end cameras actually have a mark on the camera itself which indicates the film plane. 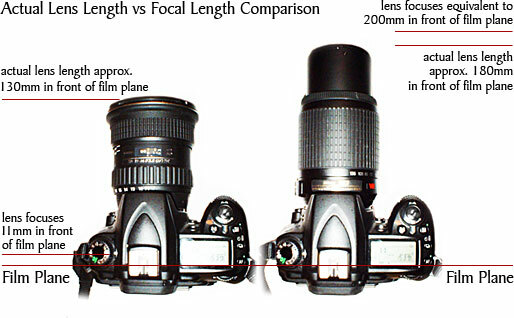 Lenses are labeled according to the distance the lens focuses in front of the film plane, called the "focal length" and written in millimeters such as "28mm". In a basic lens design, a 200mm lens would literally focus 200mm in front of the film plane, or about 8 inches (1 inch = 25.4mm, 200mm divided by 25.4 = about 8 inches). Modern lens designs may include several lens elements within the whole which create the same focal length within a more compact lens. On the other hand, a lens with a very short focal length may be physically longer because of all the lens elements involved to bring the image in to that focal length. The quality of lenses can vary greatly. Specifically, the price and/or quality of a lens varies with some combination of sharpness, color reproduction, contrast, consistent exposure, optical defects (chromatic aberration, ghosts and flares, distortion, etc. ), how quickly the lens focuses and focuses accurately, the maximum aperture a lens is capable of, whether the lens is manual or auto focus (internal or external focus), includes image stabilization or vibration reduction, the number of lens elements involved, special coatings, construction (plastic or glass and metal), weather sealing, whether the lens is considered rare or exotic in use, etc. A more in-depth article about these characteristics will be included in the future, but on the whole one gets what one pays for. There is also only so much a lens can do with regard to the laws of physics and as a result of these two factors, larger, interchangeable lenses (such as those used with SLR and some rangefinder cameras) tend to offer more options and greater quality on average than the smaller "do everything" lenses found in consumer point-and-shoot cameras.